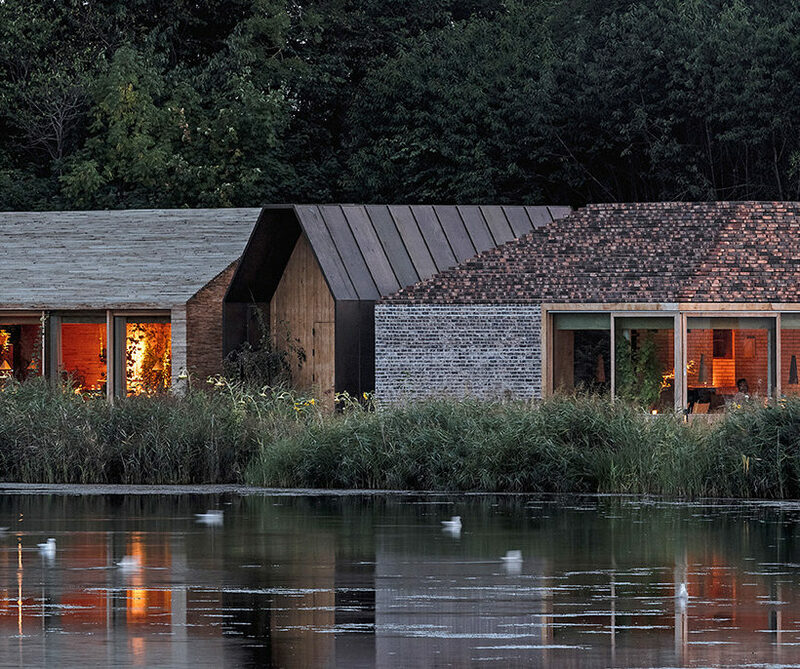 An exclusive project where everything, from the layout to the materials, the furnishings to the fabrics, would be in perfect tune with the place, the landscape and the climate of Copenhagen. 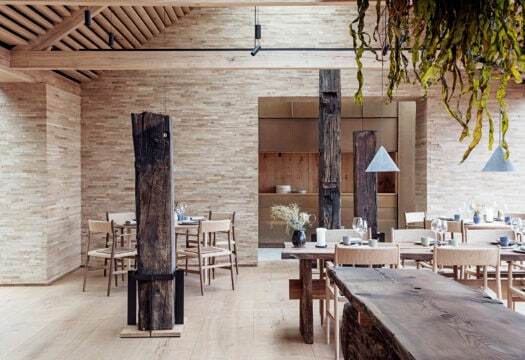 This was what the chef René Redzepi had in mind for the new location of Noma, the award-winning Danish restaurant of his creation, honored four times as the best in the world. 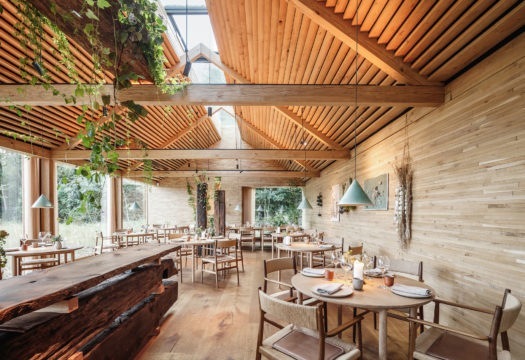 For Redzepi, more than a restaurant Noma is a culinary experience that exists in close symbiosis with nature and the traditions of the great North. The unique character of the brand was already clear when the restaurant, at the height of its success, closed its doors in 2017, only to reopen one year later on the outskirts of the capital city, in a former warehouse of the Royal Danish Navy originally used to store mines. The interiors of the reborn Noma 2.0 have been done by the architect David Thulstrup, a rising star of Scandinavian design, who this year – besides being named Spatial Designer of the Year – has received the prestigious Design Award 2018 precisely for the ARV Chair designed for Noma. We met with him in his new studio: a very luminous, large loft on the first floor of a former industrial building, to which he has just moved operations with his staff of twenty. Noma has brought you luck. What about the interior design? 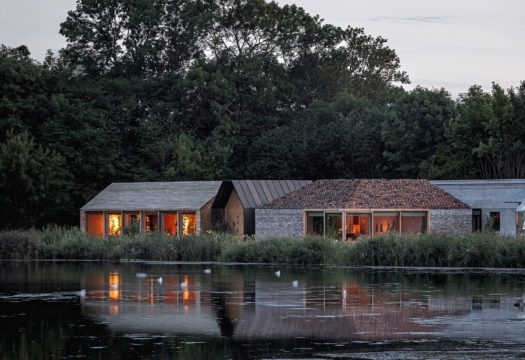 First of all I should say that it is a very Scandinavian, Nordic project, with a very precise identity, a unique character, closely connected to the nature of the place. Let’s take the light, for example: here in Denmark there is plenty of light in the summer, but in the winter it is dark for most of the day. This particular condition has to be addressed when you are designing the interiors of a restaurant, where the choice of materials – from the floor to the walls and ceilings – and the design of the furnishings become the key factors. This is especially true when you are dealing with a complex architectural solution (by the Danish studio BIG, ed.) which at times requires an equally detailed, coherent interior design. Tell us more about the new Noma. 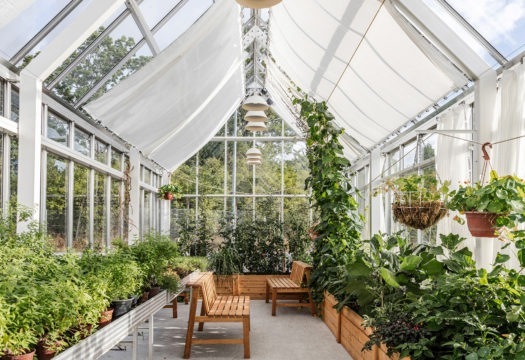 It is made up of eleven different volumes: the former warehouse has been joined by other parts, each with a very precise purpose: the entrance, the dining room, the kitchen, the barbecue area, the lounge, the service spaces, the rooms for the staff… and there are also three greenhouses. Let’s say it is a sort of mini-village, punctuated by many little houses, discreet, nicely proportioned, that extend on a strip of land between two salt lakes, in a very beautiful natural landscape. My job was to create visual and material continuity with the outside, to make a harmonious relationship among the various spaces, while focusing on comfort. With a specific objective. To make understatement the stylistic signature. In the preliminary briefing, René (René Redzepi, chef-owner of Noma, ed.) asked me basically to work on three goals he cared very much about: to convey a sense of a place that had been lived in (he was afraid it would seem too new); to put guests at ease, almost like a family gathering (he has always been against all-out luxury, just because you were eating in an star-winning restaurant); to communicate the idea of eating in timeless spaces, beyond fashions and trends (his passion for hard work had to be reflected in the durability of the furnishings and materials: “I want to stay here for another twenty years,” René reminded me, every time we went to check on the worksite). And how did you respond to such a demanding client? 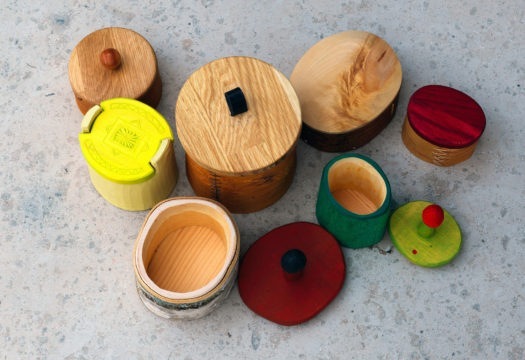 By making a careful study of the materials. 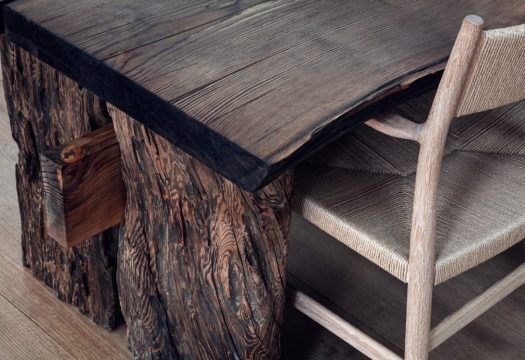 For me the choices of materials come before anything else, even before the design of the space. I like to concentrate on textures, to understand the characteristics, to discover the secrets of the materials, exploring the effects they can produce. In short, I start with the sense of the materials to understand the sense of the space and then, as a result, of its scale. For me touch is just as important as sight. In fact I would say that it is a priority to transmit that sense of authenticity, of intimacy, which gives the project a human dimension. In concrete terms, this means welcome, comfort, making people feel at ease. Always getting a table at the world’s best restaurant! 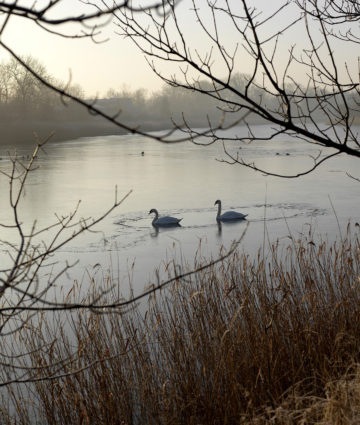 An evening image of Noma, facing a salt lake on the outskirts of the Christiania district of Copenhagen. 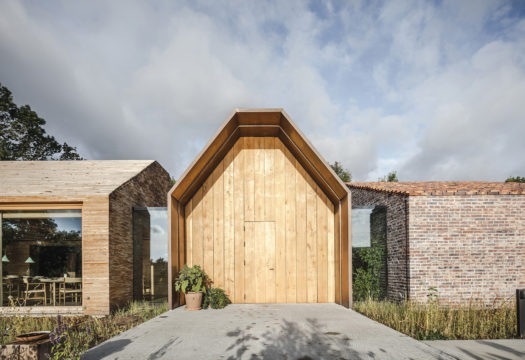 An existing warehouse has been joined by new volumes built in wood. Some of the furnishings of the restaurant. The main dining room, for up to 42 guests. The chairs and tables (ARV Collection) are custom pieces designed by Studio David Thulstrup for Noma and produced by Brdr. Krüger. The counter in the foreground and the logs placed like columns were found in the lake in front of the restaurant: they date back to the famous Battle of Copenhagen that took place at the start of the 1800s, between the English and Danish-Norwegian fleets. 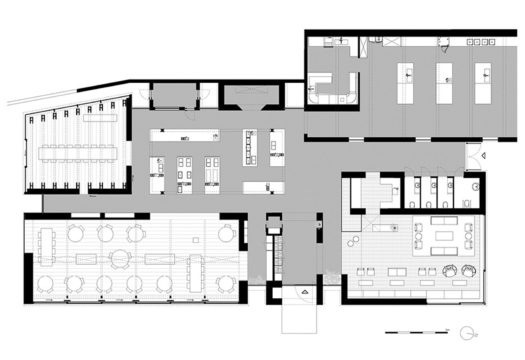 The plan of Noma, with the main volumes that organize the restaurant like a puzzle. 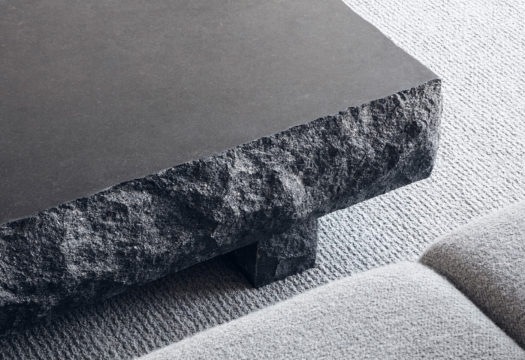 Furnishings and materials, all by the studio of David Thulstrup: custom coffee table in Swedish granite, smooth on top and rough at the sides. 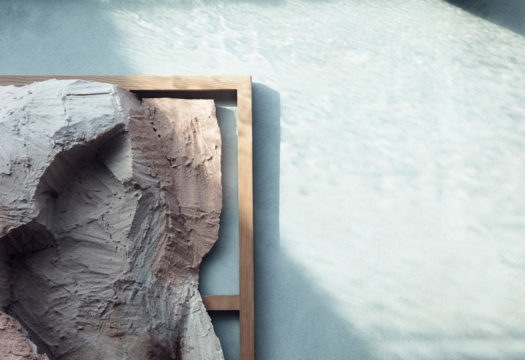 Furnishings and materials, all by the studio of David Thulstrup: works of art by Carl Emil Jacobsen, in shaped stone. 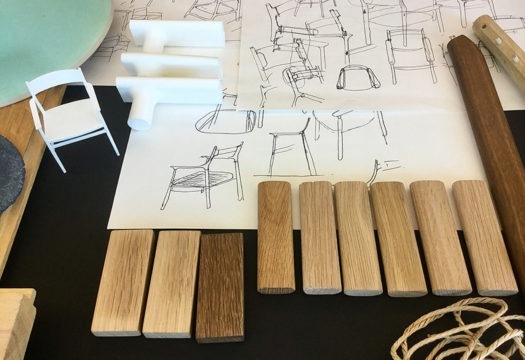 Preliminary studies for the chair from the ARV Collection, designed for Noma and produced by Brdr. Krüger. Furnishings and materials, all by the studio of David Thulstrup: ARV chair and custom table made by Malte Gormsen for the main dining room. 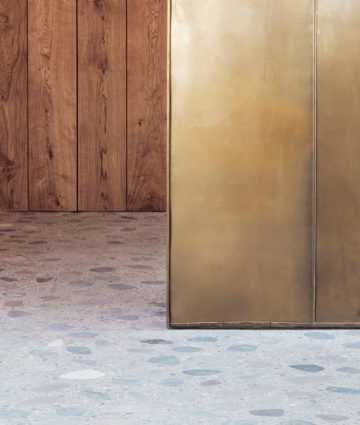 Furnishings and materials, all by the studio of David Thulstrup: floor in river stones and oak and brass panels designed for the entrance-cloakroom area. View of the main dining room from the service kitchen. 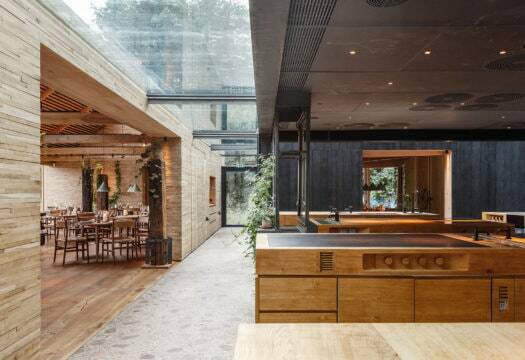 The passage with a glass ceiling and river stone floors connects all eight of the main areas of the restaurant, creating a sort of corridor of natural light. The main dining room set up for the summer, featuring the vegetable menu (the restaurant changes layout and menu with the changing seasons). The walls are faced with oak slats. The entrance to the main volume of the restaurant, reached by way of a walkway passing along the three greenhouses. The glazing seen on the left is that of the main dining room, while the brick wall to the right is that of the lounge. One of the three glass houses, for growing vegetables. The other two contain a laboratory and a test kitchen in which to develop new dishes.